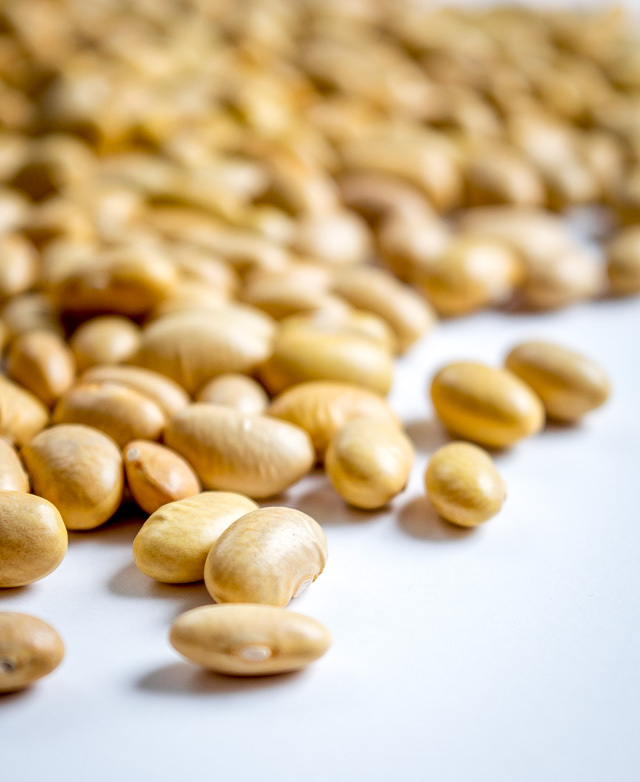 Peruano beans are the quiet sibling when sitting next to Black and Pinto at the dinner table. Black and Pinto do all the talking, constantly arguing their case for a coveted spot on your Mexican dinner plate. Peruano is happy to sit smugly next to them, confident in its case to overtake both of them in the near future. 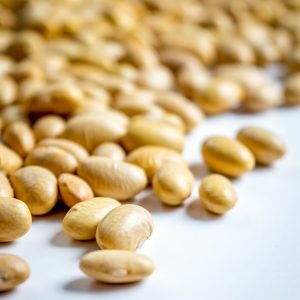 Most likely it’s their plain, unassuming appearance that has kept Peruano beans from becoming more popular outside of central and southern Mexico. It’s certainly not for lack of flavor as they have a mild, buttery consistency that makes them delicioso, and at the very least puts them on equal footing with Black and Pinto. Spend 30 seconds scrolling through our free Mexican Cooking guide and you’ll have 27 new options for dinner tomorrow night. So what’s the deal with these beans? It’s true, they can be harder to find than Black or Pinto beans. If you have a market near you that stocks Goya products you might see them there in 4 lb. bags. I get them from a Latin market that stocks products from a local Mexican goods company. I also keep seeing people mention the Rancho Gordo Mayocobas. I don’t have any experience or affiliation with Rancho Gordo, but if you need to buy them online they seem like a good place to start. 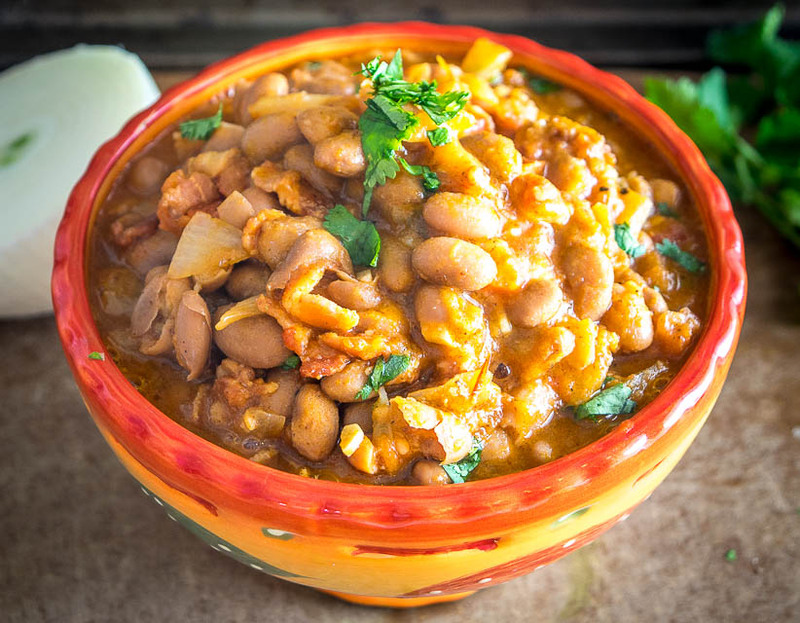 Canary beans are mild, thin skinned beans that have a creamier consistency then their brethren, and they can be cooked up in classic Frijoles de Olla style — a big pot of beans taking their time on the stove. Take a look for any rocks or shriveled beans, and then give them a good rinse. 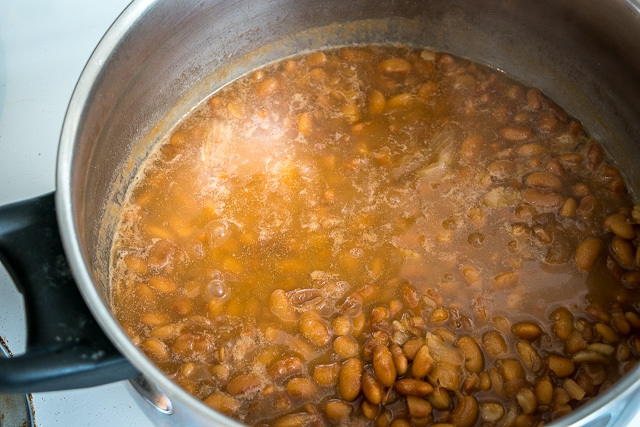 Cover 2 cups of beans with 12 cups of water (approximately), 1/2 onion, and 1-2 tablespoons of lard (optional). Bring to a boil and then let simmer for the next couple hours. Note that it’s less common to soak beans in Mexico. Of course, that comes with a slightly increased cooking time, but not as much as you would think. This batch took about 3 hours. I added a few cups of water twice to keep the water level above the beans (I also added one teaspoon of salt about 15 minutes before they were done cooking). Ideally when they finish cooking they are resting in some liquid. This makes storage easy and leaves you some broth to make epic refried beans. 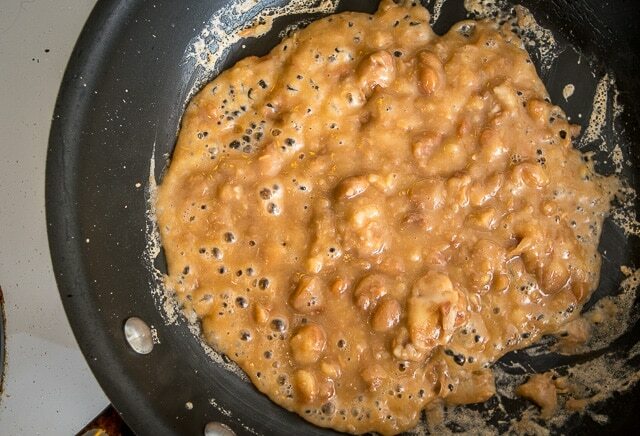 Which is probably what these beans are known for most: creamy, smooth, buttery Refried Beans. Here’s 1 cup of cooked beans that were crushed with a potato masher and cooked on medium heat in a dollop of lard for about 7-8 minutes. But the real advantage of a homemade pot of Canary Beans is the flexibility it gives your kitchen. Two cups of dried beans will make six 1-cup bags of cooked beans that will store in the freezer for months. So when you’re in a pinch, you’ve got the option of refrying that 1 cup of cooked beans and making an on-the-fly Huevos Rancheros. 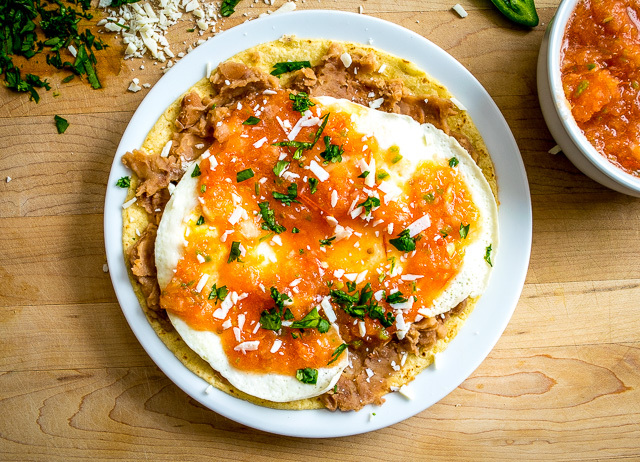 Coat a tortilla with the refried Canary beans and top with egg, salsa, Cotija, and cilantro. The return on investment here is through the roof: it takes just a few minutes to make a meal like this and the result is otherworldly; beyond delicioso if that’s possible. These will also work great in tacos, bean-and-cheese quesadillas, tostadas, burrito bowls…. And also a spoonful at a time on their own. So yes, that might be the sound of Peruano beans speaking up at the dinner table, asking for just a bit more attention. Keep an eye out for them and give ’em a try, it’s worth your time. Once you try refried beans using Peruano Beans you might never go back to Pinto! Since we are using cooked beans it takes just a few minutes over medium heat to turn them into refried beans. 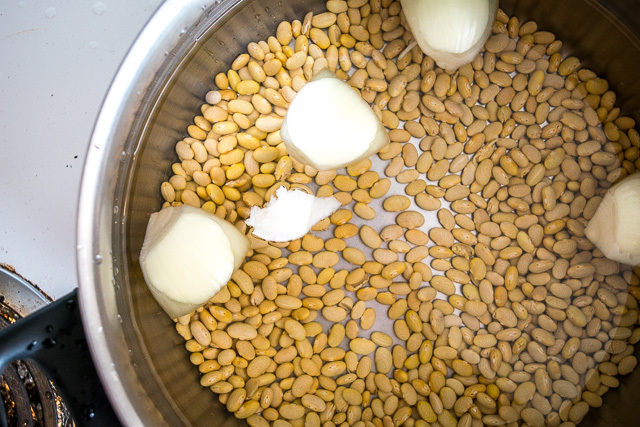 You can always add bean broth or water to thin them out if necessary. We also recently experimented with Cranberry Beans. Check out the post here. 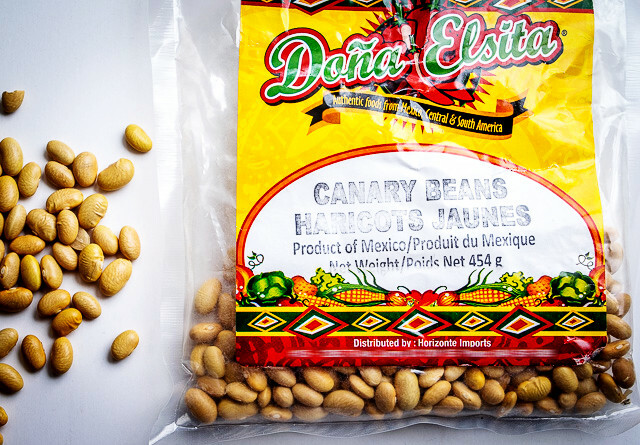 And our latest post is a batch of these unreal Charro Beans. Ahh Maine, that is far from Mexico 🙂 I’ve seen the 4 lb. Goya bags on Amazon too although sometimes the price is a little wacky. Good luck! Maybe you can let Demeter know that she can find peruvian beans on line from the packer in ten one pound package for about 1/10th the price that she will pay on Amazon. The brand is Celia’s and the company is Central Valley Ag Export. I buy their beans (several types) for $0.99 a pound at a local mexican market… But they sell in 10 lb lots by mail. Awesome! Thanks much for the tip Doctor Cooker! Thanks! Those beans sound fantastic. I also love that fried egg on a tortilla. It’s making me hungry. We had these in Mexico and no longer buy any other beans! I found your site looking at Mayacoba bean recipes … looking forward to exploring more of your recipes. re Rancho Gordo: I have no affiliation except as a VERY happy customer for 3-4 years. 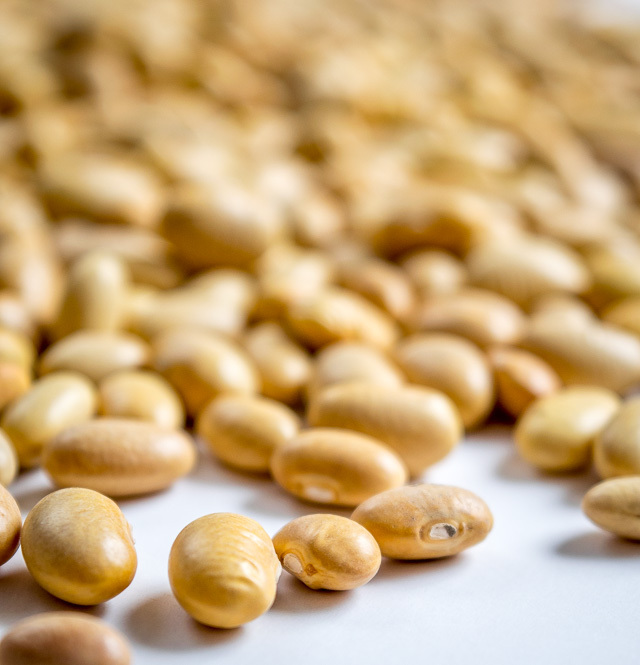 RG beans are fresh, fresh, fresh – when they run out, they are out. There is a great variety and I have become a lover of many different beans through RG. The price is right and free shipping with a $75 order (10-11 pounds of beans depending). I highly recommend. I’m eating some RG Mayacoba (refried per above !!) in a warm homemade tortilla as I write – very good! Some of my RG favorites: pinquitos, royal corona, Christmas lima, garbanzo … I never in my life thought I’d love a “lima” bean or something like the royal corona. Hope you like the cranberry beans. I’m trying them for the first time today. I bought 2# for $2.25 at save a lot. I used both pounds in 2 gallons of stock from 3 large smoked pork shank’s. 3 bay leaves, 2 cloves , 8 pepper corns, 4all spice and 2 carrots 1large red onion grated in food processor. Then added 1/2 bunch of chopped cilantro. Turned out fantastic! Served with homemade jalapeno cornbread. Thank you so much for your wondful post with pics! I have recently moved to a densely Hispanic area and as an enthusiastic home chef am embracing and exploring the local culture. At the Mercado where I get my favorite adobada de puerco I was chatting wtih the butcher and he said the Peruvian beans were his favorite. I asked how to prepare them and got most of it through the language barrier – the instructions on the package were in Spanish so I sought out your post. The pictures, especially the one where it shows the beans “bubbling up” in the skillet, were helpful and I made the beans absolutely perfectly the very first time. I don’t have lard in the house so when I fried the beans I used butter – delish! I’ve only just discovered these lovely beans two weeks ago and my third pot of them is on the stove now. Thought my first pot would last a long time so froze them in small batches, proptly thawed them as I have eaten them every day. I’m especially liking them fried in Kerrygold salted butter instead of lard and adding a little black pepper and salt. The pot that is on now has a bit of Kerrygold in with the cooking beans. The butter enhances the “butteryness” of the beans. I have some soups planned already. Thrilled with finding these little yellow gems! Great, thanks much for your note Jan! I was super excited to make these beans part of my kitchen routine and sounds like you are too, awesome! Yup, I could see how butter would make them super creamy delish. Glad you are freezing them as this makes it super easy to always have some on hand. Enjoy! Looks easy! I got a bag ready to go for tomorrow. Thanks a lot. 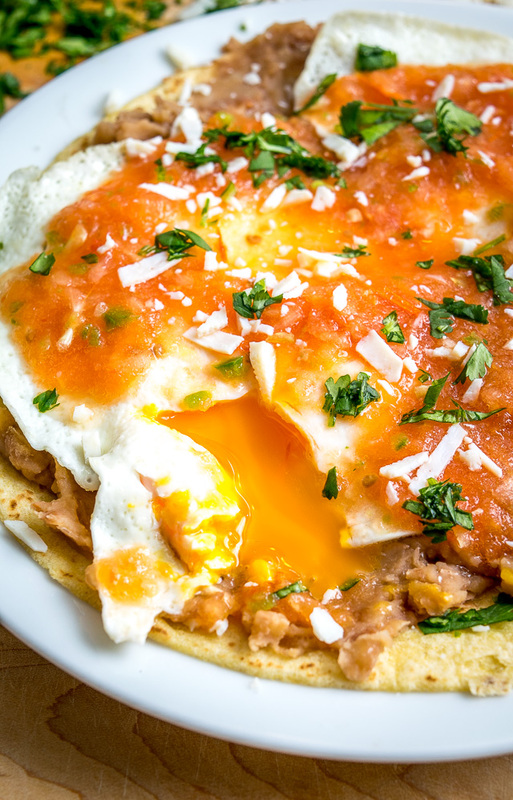 Your Huevos Rancheros look incredible. Not really common in my home growing up. Regional thing from Mexico? Thanks bearclaws, hope they turn out well for you. Now that you mention it, it’s been a couple months since I’ve made a batch of peruano beans and that is too long. Yeah I grew up in Indiana and there were definitely no Huevos Rancheros in town, but it’s probably the most common breakfast dish in Mexico, kinda like bacon and eggs in the States. Your town will thank you if you make huevos for them! I have been eating these beans for a very long time! Have a bunch of plants in my garden & just waiting for them to dry so I can put them up….not sure about yield yet but since we have a very long growing season here in the Cali desert I am putting in a second plot. Any store that sells stuff in those bins usually has loose yellow beans for about $1.15 a pound. 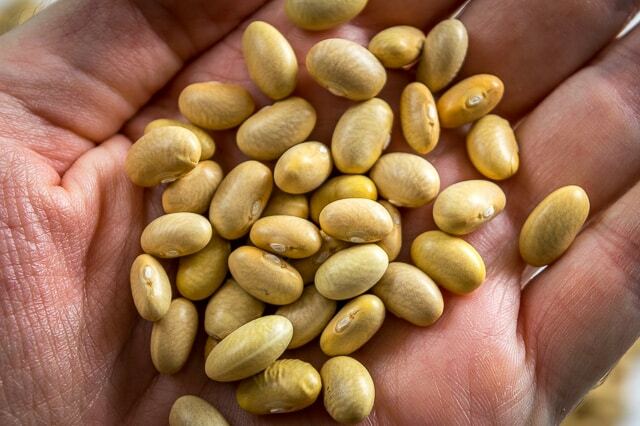 You can grow them from store purchased beans & then just keep some for your next crop. Thanks for your note Virginia! — would love to start growing Peruanos myself at some point, good to know that you can grow them from the store-bought version. Cheers. I just ran across canary beans in the Mexican section at a local grocery store and bought some. I had never heard of them but am anxious to try them. 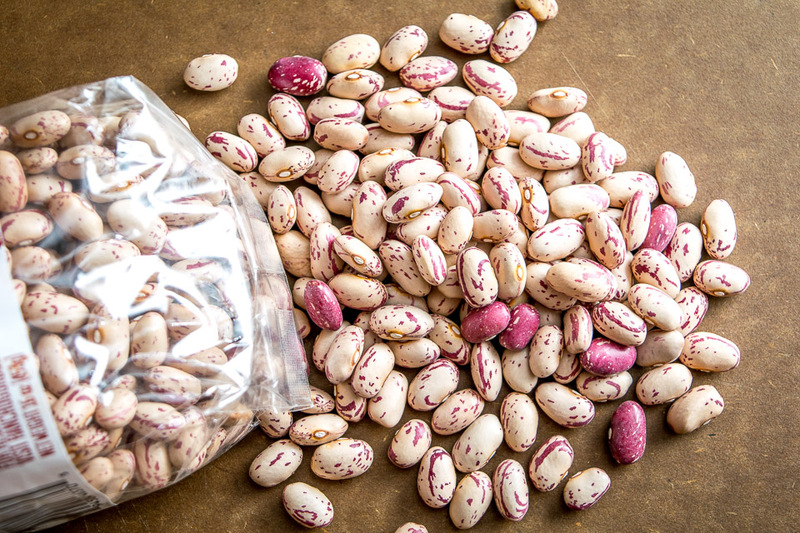 I also came across cranberry beans the same way about 20 years ago and they are our favorite. We love Mexican dishes and I’m definitely going to try beans on a breakfast burrito! Hey Cindy! Most likely you will love those Canary beans, they are definitely towards the top of my list. Cheers.